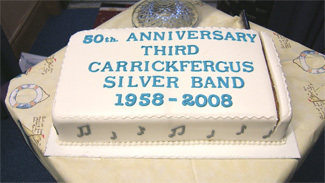 The band has been honoured with a civic reception hosted by the Mayor of Carrickfergus, Alderman Patricia McKinney, in recognition, not only of its achievements in 2008 in being BBL champions along with being named Band of The Year, but also in celebration of the bands Golden Jubilee. 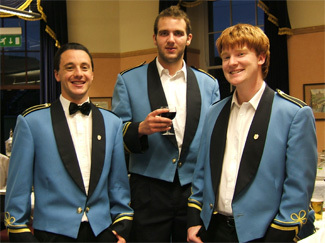 A beautiful supper was provided for the band and the event was well supported by aldermen, councillors and freemen of the borough. The band were then presented with a cake and a superb cut glass trophy to mark 50 years of music making and Des Graham, Musical Director and conductor, was presented with a set of batons in an inscribed case. The band would like thank the Mayor, aldermen, councillors and freemen of the borough for their continued support and will strive to be ambassadors for Carrickfergus for many years to come.